Although this novel is set in the future I found it very relevant and plausible. 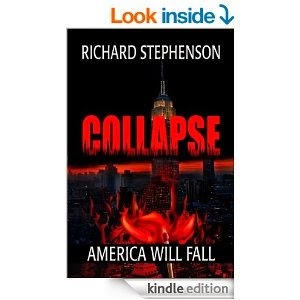 The world that Richard Stephenson has created in Collapse must surely make readers pause and wonder if this is where the world is heading. It is a fast paced novel which centres around three very different characters, who find their lives intertwined as events unfold. I found each of the characters believable and engaging. The plot is complex but Stephenson cleverly manages to make it work and I found myself desperate to know how things were going to turn out. If you like a thrilling, entertaining read then you should definitely give this one a try and the good news is there is going to be a sequel.